I think you should be called Busy Beans. 3rd Rat - No doubt! zQuilts - good catch. it's a Venezia Journal by Fabriano. I haven't reviewed it online yet. ;o)And thanks for the compliment! Your mandalas are absolutely beautiful. Have you ever tried to decipher what the Self is trying to say back to you through those mandalas? I recently started my mandala journey (pretty rudimentary ones using plain crayons) but the journey has been fascinating, specially in figuring out the meaning of a mandala. Thank you Arpitk! Yes, I do try to see what they are telling me, though I don't do that with every one - some definitely show more significance than others. I always seem to be surrounded by people, but not in an egotistical way. I like very much to help people, to inspire - I do my best to serve - through my art, my writing, and my music. 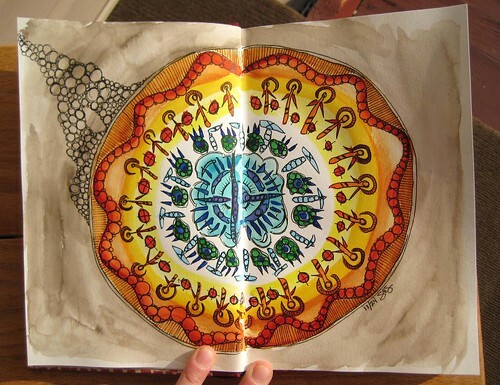 Really enjoying your mandalas. They are beautiful! I've been playing around with some of my own but they look a bit lopsided. I guess they'll improve with practice. Thanks for sharing your art and info. Doforanimals - a few tips to help straighten them... One: Spin the paper as you work. Two: Make lots. Quality will improve. Three: Forget quality & just have fun!